Newbery Medal – The Newbery Medal honors the author of the most distinguished contribution to American literature for children. Caldecott Medal – The Caldecott Medal honors the artist of the most distinguished American picture book for children. Coretta Scott King Books Awards – Coretta Scott King Book Award titles promote understanding and appreciation of the culture of all peoples and their contribution to the realization of the American dream of a pluralistic society. Looking for books for an older kid? Check out our Good Reads for Teens and Tweens! 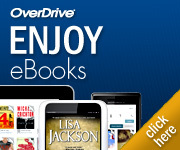 hoopla has eBooks, eAudiobooks, music, movies, TV and more for people of all ages. Check out their Disney eBooks for all ages, children’s collection, kids’ audiobooks, TV shows, and more! Find their app at the App Store or Google Play!